Here's a rather CAS card I made using some Unity and Ippity stamps. I actually made this for a call and it wasn't picked up. You win some you lose some, you know? There's no patterned paper on this card. Isn't that crazy? It's actually a little out of character for me. Some colored ink? Lots of neutrals? I'm not sure if I really like it. Hmmm... The doily is from Unity/Bella Blvd Bella Doilies and the sentiment is from Ippity's Just Wanted to Say (which is really one of my favorite sets.) I just added gems, seam binding and ribbon. Ok friends, don't forget to leave a comment since there's blog candy hidden somewhere within the Friends With Flair hop. Go over to the Unity Blog to see everyone participating in today's hop! Don't forget, Unity Stamps are on sale at Paper Maniac but only through the rest of April! AND there's a COUPON this weekend using coupon code JELLY_BEANS to get an extra 15% off orders of $30 or more! Woot! Gorgeous. Love the combo of the bright CS and the kraft! Love the unusual color combo. Very cool! Very pretty, a great get well card so cheery! Love the jewels on the doilie! I love your card. It's simple, yet not simple at the same time. Very pretty. Oh my goodness Ashley! This is gorgeous! So stunning! I love the rhinestones on the doily! So beautiful! Great CAS card with that amazing doily! So cool! Pretty card! Love the rhinestones too! 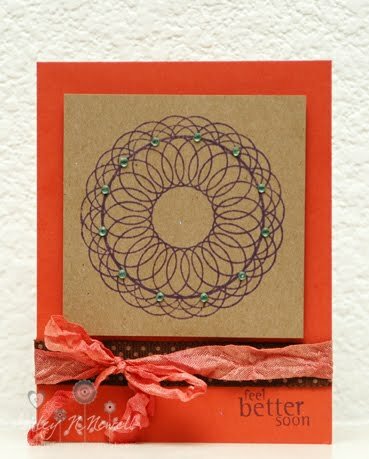 Someone will LOVE to receive this card when they aren't feeling well, great job! This card is awesome Miss Ashley!!! tfs!!! Lovely card! The colors are beautiful. What a neat image! It reminds me of a Spirograph design. I love your card!! I just ordered this set when Unity ran the sale. It should be here 2morrow. can't wait to ink it up. Great card! I love the doily in purple and your added gems are just the right touch!